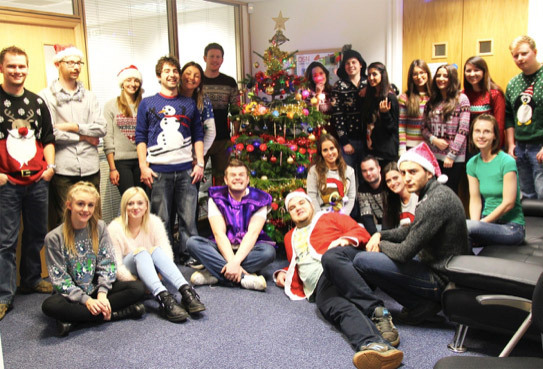 Congratulations to Sarah and the team for the successful Christmas jumper day! Much merriment was had and all in the name of charity – a very important charity at that; Save the Children. 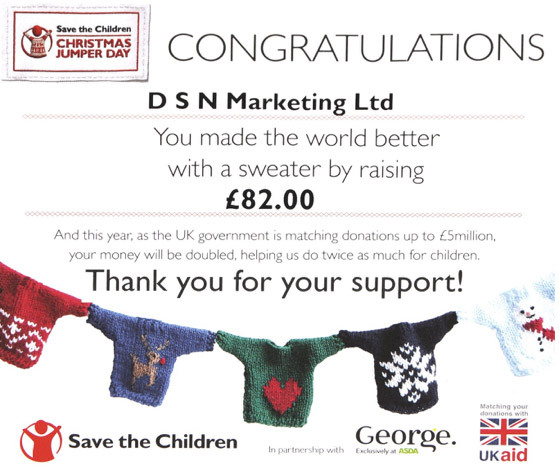 At the end of 2014, DSN took part in the fantastic Christmas jumper day campaign run by Save the Children, with all of us showing-off our festive finery for a good cause. It’s nice to put down the pens (keyboards), stop all the marketing, media, logistics etc., and reflect on the more important things from time to time. It’s easy to forget how hard the festive season must be for some people, which is why charities such as Save the Children play such a vital role; we’re glad we can do a small bit to help. We’re hoping to do many more charity events throughout the year, so watch this space! You can find out more about this amazing charity on the Save the Children website. In the meantime, give us a call or drop us an email if you need any help growing your online business – our digital marketing team is waiting to hear from you! DSN Marketing are heading to the Ecommerce Expo 2015! Digital marketing news – Linnworks integration with Cdiscount! 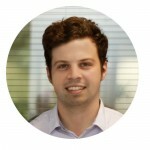 DSN Marketing is a marketing agency and consultancy that specialises in providing ecommerce solutions for retailers who wish to enter online marketplaces, or simply want to improve their performance on existing channels. If you would to talk to us then please feel free to drop us a line. or call us on 01403 267 877. All rights reserved DSN Marketing Ltd 2014. Sorry there isn't anyone available to chat right now, but please drop us an email or get in touch through the contact form and we'll get back to you ASAP! Welcome to DSN! How can we help you today?